A Spokane writer has turned a soldier’s rescue efforts into children’s nonfiction. “Why did you do this?” After months of recovery efforts in the aftermath of the 2003 American invasion of Iraq, a crowd of Iraqis gathered at the Baghdad Zoo are screaming at an American Army captain. Another soldier, possibly drunk, had stuck his arm in the cage, “trying to feed the tiger a kebab.” But Malooh clamped his jaws on the soldier’s arm and began shredding. Then came the gunshot. Months spent rehabilitating a creature that had already undergone so much pain lay wasted. Sumner’s unit was first assigned to archiving the priceless relics of the Baghdad Archaeological Museum. But all that changed when Sumner’s commanding officer suggested that they check out a small abandoned zoo. 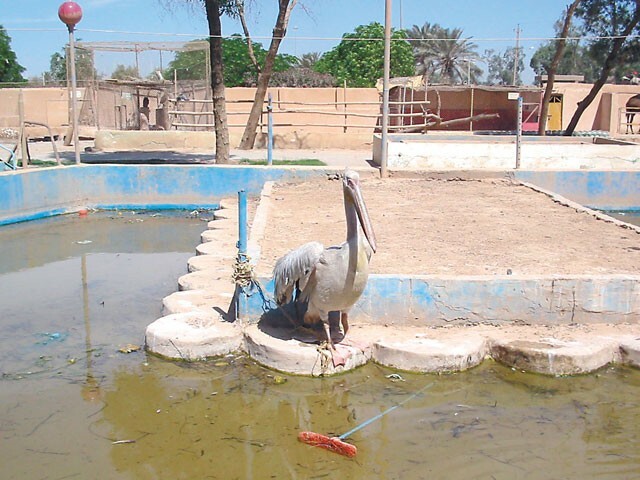 That “small” zoo turned out to be one that was once the largest zoo in the Middle East. When Sumner stepped through the metal gates embossed with the profile of a tiger, he discovered that out of 500 animals that once lived at the Baghdad Zoo, only 32 remained. The zoo workers were gone. Caged animals were alone in their cells, lying in their own waste and at the point of starvation. After seeing the devastation these animals were enduring, Sumner didn’t just think about doing something — he knew he had to do something. “Once I made the decision to rebuild the zoo, I never looked back on any other option,” he says. For awhile, it seemed that every good thing the unit had done for the zoo after its discovery and for the neighboring war-torn Baghdad had been eroded by the reckless act of a single American soldier. Years later and back in the States with his family, Sumner — now promoted to major — felt that his experiences at the Baghdad Zoo were tales only his young daughters and relatives would listen to. But Spokane resident and children’s author Kelly Milner Halls had called Sumner to interview him about another topic: his rescue efforts centering on the recovered Arabian horses once owned by Saddam Hussein and worth millions of dollars. Sumner had led the rescue of the beautiful horses, said to possess the purest Arabian bloodlines in existence. Milner Halls didn’t even know that Baghdad had a zoo. But after that first interview, she and Sumner worked together to create a 64-page children’s book titled Saving the Baghdad Zoo. It tells the stories of Malooh, of a camel named Lumpy, of an alcohol-addicted bear, and of a slew of other animals rescued by the combined efforts of the coalition forces and Iraqi civilians. The book’s first printing of 25,000 was gone two weeks after it was released in February; it’s already in its second printing. Hollywood is looking into making a movie. And Milner Halls is now doing a book tour, sharing with young readers the sad circumstances of the zoo’s animals — along with how now the Baghdad Zoo has been rebuilt. Today, it stands as a flourishing symbol of hope for many Baghdad citizens. And Major Sumner had thought that the story of the Baghdad Zoo wasn’t particularly worth preserving. Kelly Milner Halls presents Saving the Baghdad Zoo – and authors Chris Crutcher, Terry Davis and Claire Rudolf Murphy present their books on Tuesday, April 27, at 7 pm at Auntie’s Bookstore, 402 W. Main Ave. Free. Visit auntiesbooks.com or call 838-0206.